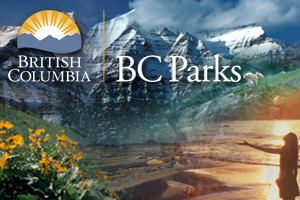 For information concerning the Vehicle Accessible Campground, contact the Park Caretaker. Please note the telephone number for group reservations is not in operation until the end of April each year. Be aware there is a “Boil Water Advisory” in effect at this park. Please note: Kitty Coleman Provincial Park is classified as a Class “C” park, whereby the park is managed by a local community board. Situated on the south side of the Strait of Georgia, Kitty Coleman Provincial Park is a popular destination for swimming, boating, fishing, and oceanfront camping. The park protects the mature forest of Western hemlock, Western red cedar and Douglas fir in the upland portion, the estuary of Kitty Coleman Creek, and 900 metres of shoreline. Park facilities include a picnic shelter, picnic tables, pit toilets, two boat launches, several nature trails and camping for individuals and groups. Special Features: The eastern portion of the park is home to a single majestic old-growth Douglas fir, estimated to be more than 500 years old. Wild onions can also be found growing throughout the area. This Class “C” park is managed by a local community board. While no reservations are taken for individual sites, reservations are accepted for group camping or group use of the picnic area by contacting the Park Caretaker at 250-338-1332. Please note the telephone number for group reservations is not in operation until the end of April each year. Kitty Coleman Park is located 6 kilometres northwest of Courtenay on central Vancouver Island. This park is accessed via Coleman Road off Hwy 19A, north of Courtenay. Turn on Left Road, then right on Whittaker Road until you reach the park. Nearby communities include Courtenay, Comox Valley, Merville and Campbell River. History - The original park was donated to the settlers of Merville around 1900 and operated by the community until the 1940s, when financial difficulties led to the province assuming management responsibility. Kitty Coleman was established as a Class “C” Provincial Park in 1944, and a community park board was set up to oversee its operation. Opportunities for canoeing or kayaking exist from this park. The waters around Kitty Coleman Park are popular for angling. Salmon and rock fish are the most available species, along with a variety of shellfish that can also be found in the area. Fishing is permitted as per provincial and federal fishing regulations. All anglers should check the current regulations issued by Fisheries and Oceans Canada prior to fishing. Anyone fishing or angling in British Columbia must have an appropriate licence. Kitty Coleman park offers a series of nature walking trails, which run through a mature forest and alongside a stream. For your own safety and the preservation of the park, obey posted signs and keep to designated trails. Shortcutting trails destroys plant life and soil structure. Seals, sea lions, whales, Dals porpoises, sea birds and Bald eagles can all be spotted from Kitty Coleman Park. During the summer, passing cruise ships on their regular routes north and south offer a spectacular sight. There are two paved boat launches located in the park. The launch fee is $45/year or $10 per daily launch. Campfire rings are provided at most campsites and in the group campground. Firewood can be purchased from the Park Operator. Fees for firewood are set locally and may vary. To preserve vegetation and ground cover, please don’t gather firewood from the area around your campsite or elsewhere in the park (this is a ticketable offence under the Park Act). Dead wood is an important habitat element for many plants and animals and it adds organic matter to the soil. You can conserve firewood and air quality by keeping your campfire small. Limited burning hours or campfire bans may be implemented. Be prepared to bring a portable stove for cooking. Fresh water hand pumps are located throughout the park. Be aware there is a “Boil Water Advisory” in effect at this park. This park has 1 group camping area that can accommodate 4 to 6 units. Group camping reservations are available from May to September. Phone 250-338-1332 for reservations. Please note that the telephone number for group reservations is not in operation until the end of April each year. Please note: There is no sani-station/dump in this park. The closest facility is located at Miracle Beach Provincial Park. There are 65 vehicle accessible campsites at this park. Many of these sites overlook the beach.